What Happens During a Trusty Tails Meet And Greet? 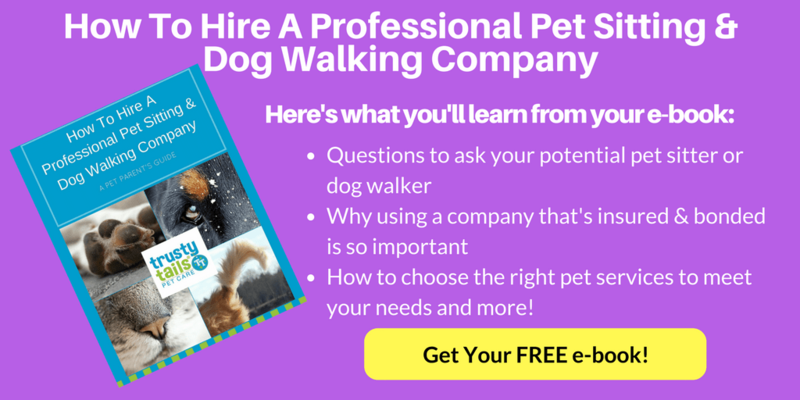 You are here: Home / Hiring a Dog Walker / What Happens During A Trusty Tails Meet & Greet? The first thing that will happen after you sign up for our services (or even if you’re simply interested in them but want to chat with us before signing on) will be a meet and greet in your home at a time that’s convenient for you. Your first meet and greet is on us – that’s how excited we are to welcome you to our Trusty Tails family! During this meeting, you’ll be introduced to your Trusty Tails team: most likely, this will be a member of management, your primary walker/sitter, and your secondary walker/sitter. Since this is the group of people who will be in and out of your home with your pet, we want to make sure that you’re comfortable with them. It’s important to us that you know who will be taking care of your fur baby! You’ll take us through your pet’s regular routine, introduce us to their home and behaviors, and expand upon the information you’ve provided in your pet’s profile. This way, we can always be sure to provide exceptional care for you and your dog or cat (or rabbit, chinchilla, lizard…our sitters are open to all types of creatures, great and small). If they have special medical needs, feeding procedures, or any other habits you’d like us to be particularly aware of, this is a great time to bring them to light. Show us where leashes hang, kibble is kept, favorite hiding places, and anything else you think may be of use to your sitter. Don’t worry – our staff members aren’t shy and won’t hesitate to ask questions to better help them meet your pet’s needs. Please provide us with two tested, working sets of keys as well, including fobs or access cards, so that we can access your home while you’re away. We’ll also be able to answer any queries you may have about our services and procedures, walk you through account setup, and give you the peace of mind you deserve to have, knowing that your pet will be loved and cared for as one of our own. Our team is more than happy to provide you with more information on local trainers, groomers, vets and the like if you’re interested in that as well. More than anything, we aim to end every meet and greet with all parties feeling content and prepared for what’s ahead. From there, sit back, relax, and wait for your first pet care journal to arrive in your inbox! Interested in finding out more about Trusty Tails Pet Care and how we can help? Call us at 201.446.1559 or contact us through our online form on our website. You can also check out our FAQs and our Learning Center to find out more about how we operate.